I have very eclectic taste in music. I can easily switch from country to rap after I just listened to 4 Non Blondes and The Temptations. So, being so out there, I run into a song or two someone pulled up on YouTube that, for the life of me, I can’t find to download anywhere. Embarrassing example: I used to hate Miley Cyrus. Everything from Hannah Montana to her coat tail ride to fame via her father. Then I stumbled on her Backyard Sessions. Wow… No pop trying to be disguised as country? A decent sound to her voice? A very laid back, “take me or leave me, but this is what I do every Sunday” vibe to her? I loved it. She’s starting to grow on me. But even more so, my 2 year old daughter LOVES it. She sings over half of the words and does an adorable face squint at the higher notes that forced me to play it over and over. One problem – the Miley Cyrus version isn’t available to download, or at least when it first came out (I haven’t checked in months). Whenever Ev hears the Dolly Parton version, she gets confused, so YouTubing it every time was a real pain. So I see this and see a world of possibilities and tried to not get my hopes up. The disclaimer on the website says that it’s a free service with no sign up needed, and the pin claims it to be legal. Its worth the risk of virus to me, and I gave it a try.. It worked! Though I don’t know the full legality to it, and I just did it today so as for my computer it isn’t acting funny (yet? ), but I have my song! The window of opportunity has opened, and I give this pin a…. 1) the Pin mentioned it being legal. Yes, YouTube is a free and legal site, and you would think loading only the audio to a downloadable format would be free too, but the website does not publish it as such. 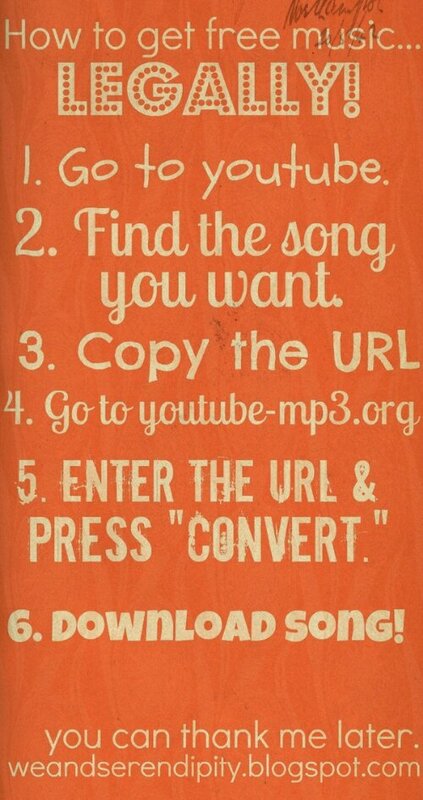 2) it is only downloadable into one format. Me, being the black sheep of the tech world and refusing to go with the “I” devices in the beginning really bit me in the end, especially since I love my husband’s iPad. So anything only available for download into iTunes means I have to go through the extra step of converting into a Windows Media friendly format. One click. Really it’s not even much of a complaint and more of a heads up! Follow my blog and my Pinterest boards for more of the things I do and other fun stuff! 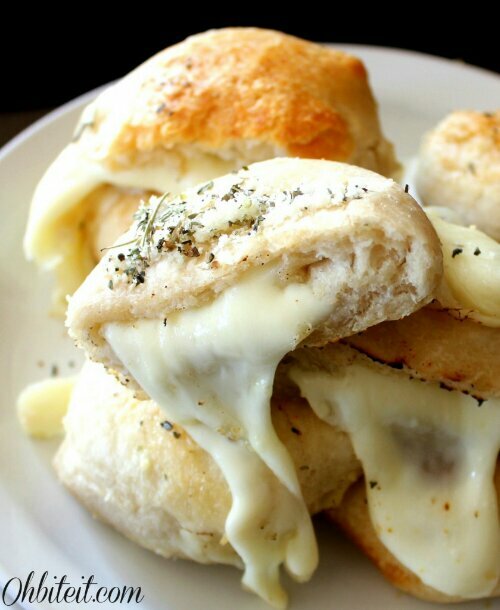 Mama’s In The Kitchen: Biscuit Bombs! 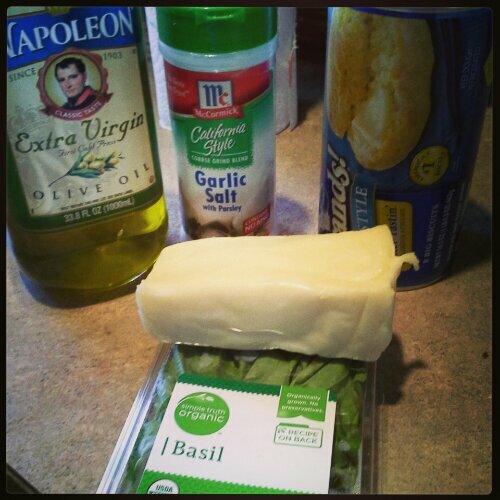 I am always looking for a way to kick up our weekday dinners on the cheap. Either from low-cost ingredients or from things I would already have in my fridge. Sure, spaghetti and tacos are always on our menu, but I am someone who can’t have the same thing, over and over, without eventually escaping to Jack in The Box. So, anything that I can make, from sides to main dishes that can bring some life to our plates – I’m in. This recipe is one I found on Pinterest a while ago. I’ve even made it as a meal in itself, but really it’s the perfect side for a lot of dishes. This picture is taken directly from the website. I don’t know where this girl got it from, but bravo. 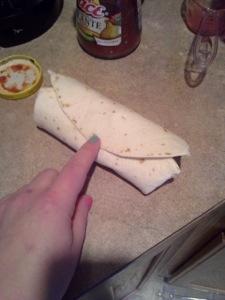 I would come to your house for dinner every night if it meant eating this way. I had paired these with a stuffed salmon from Costco that my dad had bought for us, and it is also great with just about any pasta dish. Not to mention that you can customize it to be practically anything. First, flatten a biscuit. 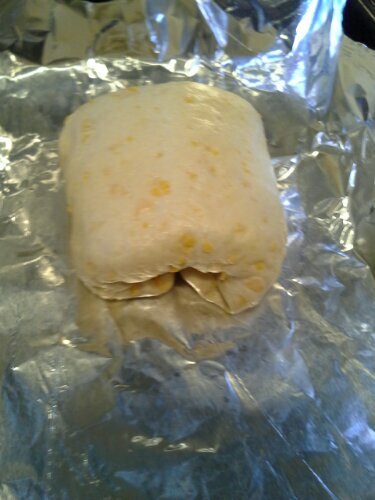 Then load it with cheese and other deliciousness. In my case, mozzarella and fresh basil. Yum! 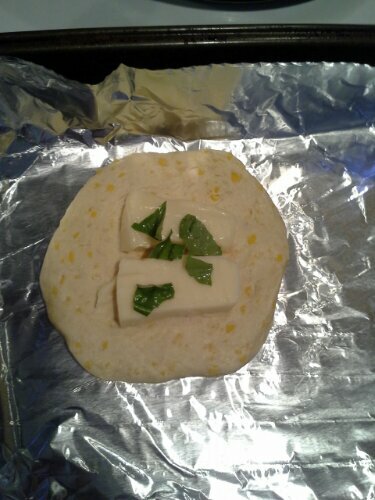 Fold the biscuit over the cheese so it is completely sealed, and put it in the pan with the seal down. And really, load em up! Stuff them full. Worst case scenario they burst out the sides with gooey deliciousness. Bummer. After all your biscuits are loaded, brush them with oil and season them to taste. Salt, pepper, parmesan as the original recipe showed.. Whatever your hearts desire.I chose a simple sprinkle of garlic salt. Let me just apologize for the sheer awesomeness of these bad boys really quick.. They’re so amazing, they were gone before I remembered to take a final picture. But they came out just as beautifully golden and soft as the original picture, oozing and bursting at the seams with melted goodness. Follow my blog and my Pinterest boards to see what I do and other fun stuff! Another Pinterest pin put to the test. Really, why not have me try them for you and weed out the ones that have broken links, are links to links three pages away, or are filled with recipes or instructions that don’t work? This is a photo taken directly from the website. 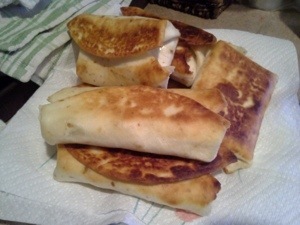 The recipe on the web page is actually called “Chubby Chicken and Cream Cheese Taquitos”, but the original pinner probably thought the same thing as me when I read it: chubby = calories. My reaction when I read the recipe? Intimidation. I have never fried anything but chicken, onion rings and french fries… I powered through though! 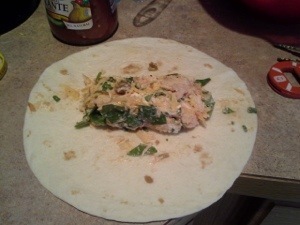 In case you didn’t read the recipe, here’s the breakdown: shredded chicken, cream cheese, sour cream, shredded cheese, salsa, spinach salt and pepper, wrapped in tortillas and fried golden crispy. The best part? It’s as easy and delicious as that sounds. Again, I was intimidated, but then I started the process and it was surprisingly easy. Testers note: make sure your cream cheese is fully softened. I thought mine was, thought it blended well, but I still got pockets of cream cheese in my finished product. Not really a bad thing, just not the best – totally my fault though. 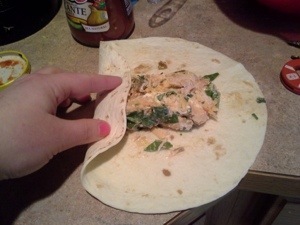 Then I put enough into a tortilla that it would stuff it, but still be able to close. Sorry for the crummy photography. One hand on a cell phone. Anyway, as you can see, I stuffed mine to the point that they were more chimichangas than taquitos, but it’s still pretty much the same thing in the end. Just super sized. 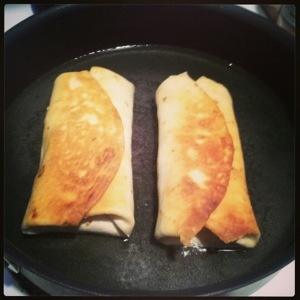 Make sure that when you fold the tortilla, you fold it so it closes on all sides. 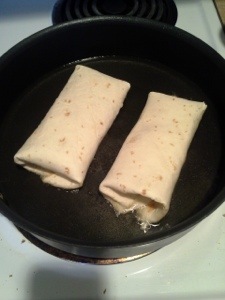 I heated a pan of oil on medium heat and placed 1-2 taquitos at a time seam side down. After they were golden on both sides I let them drain on a paper towel. I don’t think I can express to you the magnitude of delicious, crispy, wonderful-ness that was made in my kitchen last night. The hype from these pictures among my friends on Facebook and Instagram alone was enough to preach something, without them even tasting it! The only down side is the recipe may as well have made a million since I was only cooking for my husband and myself. Even though I think he ate 3 (good lord) and I ate 2 (I was so full after!) we still had leftovers. I even brought an extra to work with me for anyone to try. Get this, my lactose intolerant friend liked it so much that she risked it and ate a whole one, she liked it that much. Back up and look at the ingredients. I’m sure she had a bad night. Worth it. The only things I can find wrong were my own fault! Not blending the the cream cheese and not halving the recipe so it didn’t make as much were things that are clearly avoidable. They were easy, delicious, and caused a stir. 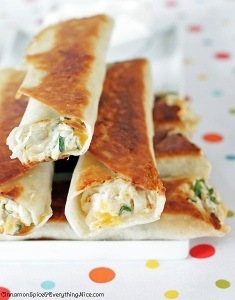 Great for big family dinners, made smaller as an appetizer, or cut the recipe down to just liven up your Tuesday! I can guarantee this is now a staple in our house! Cinnamon Spice and Everything Nice, thank you for your contribution to all of our kitchens! Follow me on Pinterest to see when I test more pins and for other awesome stuff! I’m running into more and more pins, that are pins of pins of pins on Pinterest. So many are just impulse repins that I will look at later or sometimes never even open. And most of those I don’t bother to change the verbiage and realize much later that it has “I” or “we” or some personal endorsement I didn’t sign up for. So I’ve decided to scour through my hundreds of pins and test the validity of their claims. I’m going to start trying what I pin, giving a play-by-play, and rating it on a scale of one to ten based on the ease, the accuracy, and the overall worth of the pin. There will be a lot of recipes, but also some domestic and project type things. This is another pin of a pin that eventually made it to me through my best friend. The first impression I get of this is that it is quite possibly the easiest dessert I could make, combining both premade ingredients and actual mixing and baking. Kind of a strange title too, a chocolate chip cheesecake would be a cheesecake with chocolate chips, not a chocolate chip cookie cheesecake… Whatever. 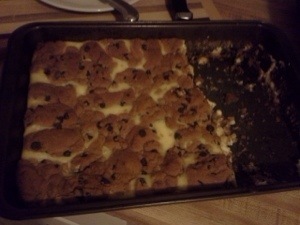 In case you didn’t read the recipe, essentially it is some cream cheese, sugar, vanilla and eggs, whipped together and laid out on premade cookie dough with cookie dough on top. Sounds simple and delicious, right? You would think combining two of my favorite things would not only be a breeze to make but also a party in my mouth…. First step, cutting the premade dough into 1/4 inch pieces and pressing them together so there are no seams at the bottom of the pan. Whenever I make cookies from premade dough, I usually get some crumble. 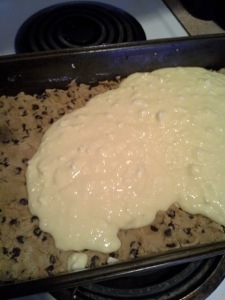 But then I just form the cookie back in the shape I wanted and the bake just fine. This roll of dough, however, did nothing but crumble. Since it was the crust and it would all get pressed together anyway, I just assumed it was a crummy roll of Pilsbury and went along my way. 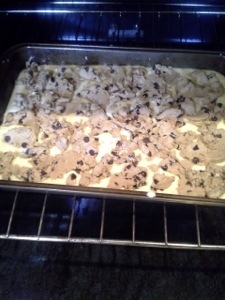 Then mix all the ingredients that are not cookie dough together in a bowl. I don’t know about you, but I don’t have an electric mixer (my KitchenAid s in storage), so I almost always have chunky cheesecake batter. 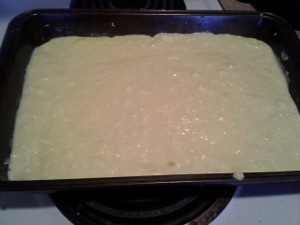 It all melts together while cooking and tastes the same anyway, but the batter always looks a little… Weird. 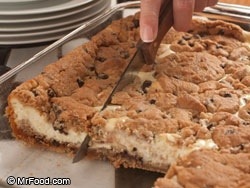 Pour the cheesecake mixture over the cookie dough crust. Maybe it’s Pilsbury? Maybe I got the two worst rolls at the store? Or maybe they even expected me to cut the dough on a cutting board, mold them perfectly into cookie shapes and then lay them on the cheesecake? Either way, it didn’t work. Nothing but crumble once again. So even though I didn’t get a uniform look, I just embraced the crumble and made it look on purpose. The recipe says to bake at 350 for 45-50 minutes. I never trust a recipe, and in this case I am very happy I didn’t. 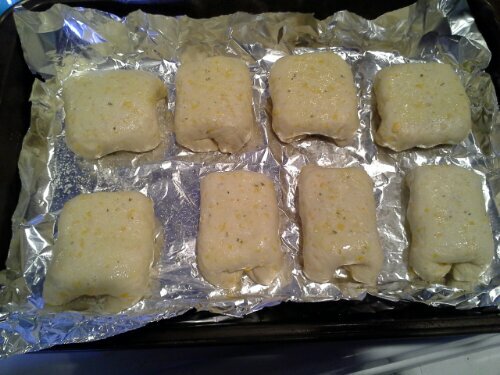 At least in my oven, it took 10-15 minutes less than required. I put it in for 30 minutes and checked on it, and it was completely done. I left it in for another 5 minutes to get a more golden crisp to the cookies. At the rate the cake baked, it would have started to burn if I left it in that long. 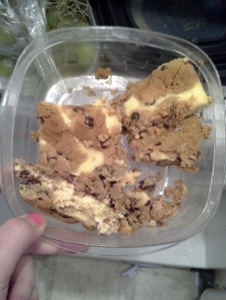 I’ve made and eaten store bought cookie cheesecakes before and all of them were better than this. The cookie part was delicious, but the cheesecake was a little bland and it kind of distracted from the flavor of the cookie even. Still clearly edible, and a fast, cheap and easy dessert for you to bring to a party. My family still enjoyed it, it was still eaten. It is still a sugary and slightly chocolatey dessert. However, if you’re looking for a dessert to make to impress, for you to enjoy personally, or have time to try something new with a little more effort, it would be worth it for you to explore other options. If you have a work potluck, a baby shower to go to, or 5 Christmases to contribute to and need something fast and easy, this recipe really is just fine. It’s still mostly premade with little effort, and it still has some tastiness to it. However, my own troubles with ingredients, the fact that the recipe timing could have completely screwed me, and then the lack of flavor in the cheesecake brought it down a few pegs. Thank goodness the pin didn’t have some crazy “best dessert ever!!!! !” million exclamation point endorsement on it. 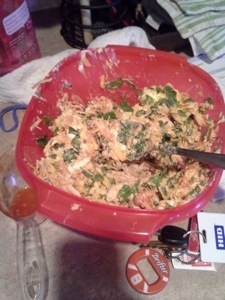 As a side note, it actually ended up tasting better after it had been in the fridge a few days. I have no idea why, but if they would have tasted like this the first time around, I’m sure it would’ve been a higher score! Follow me on Pinterest to know when I test more pins and for some other awesome stuff!